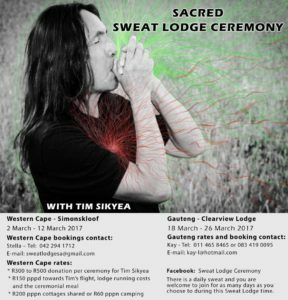 In 21 days, we’ll be welcoming Tim Sikyea for our Sacred Sweat Lodge Ceremony, now entering its 6th year here at Simonskloof Mountain Retreat. Please contact Stella at Sweat Lodge sweatlodgesa@gmail.com to book and express your gratitude for Mother Earth’s unconditional Love. This entry was posted in News by Jurgen. Bookmark the permalink.